We buy junk cars for cash in Kentucky! There’s nothing like driving around the bluegrass state of Kentucky. With rich national parks and a huge number of streams and lakes, relaxing in Kentucky is easier than ever. But if you want to keep relaxing, you might want to get a bit of spare cash by trading in your old junk car. That’s where we come in! The Clunker Junker is the best way to get cash for cars in the state of Kentucky. Not only that, but we’ll even pick up your car completely free of charge. Kentucky has a long history with automobiles. Ford Motor Company started producing their famous Model T cars in Louisville over 100 years ago in 1913. Since then, Kentucky has been a hotbed for automobile production including Ford F150s, Chevrolet Corvettes, and Toyota Camrys. It’s no surprise Kentuckians love their automobiles! That’s why The Clunker Junker is committed to offering top dollar for junk and used cars! We buy junk cars, trucks, vans, and SUVs all across the state of Kentucky and pride ourselves on having world class customer service to boot. If that old clunker sitting around in your driveway hasn’t aged quite as well as a Kentucky bourbon whiskey, it might be time to sell your junk car to The Clunker Junker. Sure, you could try and get cash for junk cars from a Kentucky auto salvage yard, or even post up some ads on classifieds websites, but you’ll quickly find they will give you more of a run around than the Kentucky Derby! The Clunker Junker will give you an instant offer right now, and it will only take a minute. What do you have to lose? What kind of clunker do you want to sell? We’re willing to pick up practically anything with four wheels and an engine. The amount of cash you’ll get may vary, but as soon as you have made the decision to sell, we’ll make an offer. Let us know what year, make, and model the vehicle is, and also its condition. Let us know that you are looking to have your junk car removed from your home in Appalachia. We’ll give you an instant cash offer. If you accept the offer, you’ll be the proud new owner of a handful of cash. We’re masters at buying junk cars in Kentucky. We’ll swing by your home and pick up the junk car to whisk it away. You won’t need to worry about environmental protections on car disposal or finding a distant junk yard. How Much Can I Sell My Junk Car For in Kentucky? You might be wondering how much you will get when you sell your junk car in Kentucky – it’s hard to say with certainty, but here’s a quick guide. In general, you’ll make as much money selling your old car in the Cumberland Plateau as you would in the Jackson Purchase – no pun intended. Kentucky junk car buyers are eager to pick up these cars. Auto salvage yards will pay by the pound for the valuable metals in the car. The car parts themselves can sometimes be sold for more than salvage value if they are still operating. The stereotypes about the junk cars in Appalachia don’t matter much to us! Even if it’s a rusted mass of metal, we’ll be willing to swing by and pick it up. Don’t think twice about whether someone would want whatever clunker you’ve got. You can expect between $50 and $225 for these wrecks. Got a car that isn’t ready for the junk yard but you still want to sell it? We buy junk cars in Kentucky that still have some of their non-materials value. These cars will be much more valuable than the rusted hunks of metal at the scrap yards – expect to earn a bit more for these. Even if your car is only a bit used but otherwise in good working condition, we’ll buy it. While we’re known for junking clunkers, we’re also happy to purcahse practically any other kind of car too. You can expect anywhere from $200 to $15,000 for these cars; the sky is the limit! 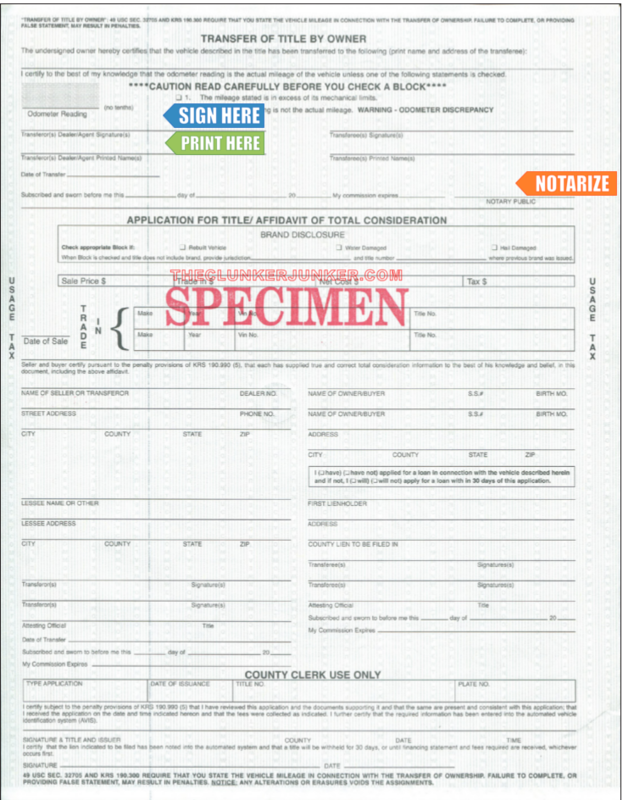 Required: The state of Kentucky requires that all titles are signed in front of a notary public! We have put together a simple guide and example for how to sign your Kentucky title when you are selling your vehicle. If there are multiple owners listed on the title, they must all sign the title unless the names are separated with "OR". In Kentucky, there are two different ways you might have to sign your title. If you have a Kentucky title and are selling your car within the state, you will need to sign and notarize the front of your title in the dealer only section (yes, really!). Please do NOT follow the image below. However, you should only do this if you are selling to The Clunker Junker. 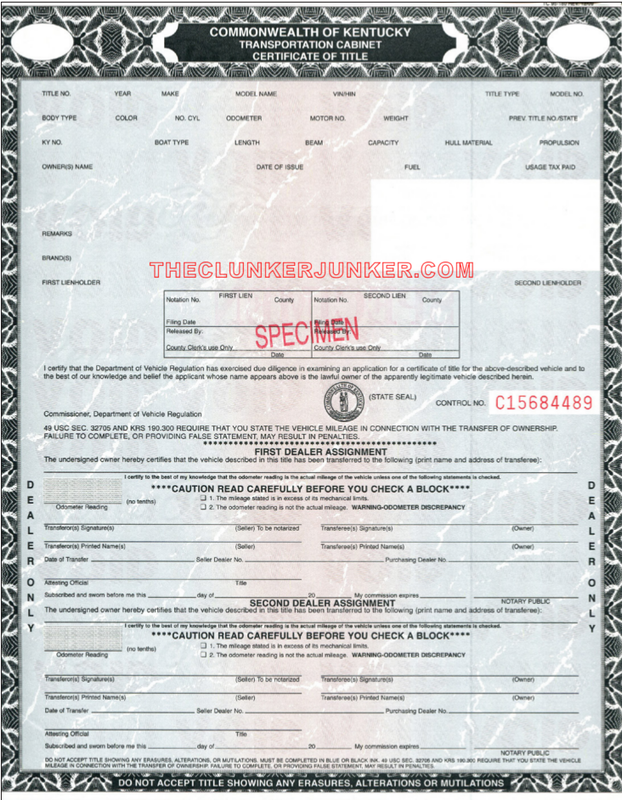 If you are using our website as a reference for a private sale, sign and notarize the back of the title instead. If you have a Kentucky title and are selling the vehicle outside the state, you will need to sign and notarize the back of the title. Use the image below as an example. First sign the back of the title where indicated by "Transferor(s) signature". This will need to be done in front of a notary. 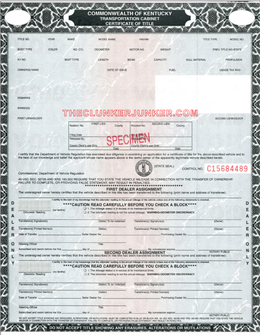 Print (don't sign) your name on the back of the title where it reads "Transferor(s) printed name(s)". 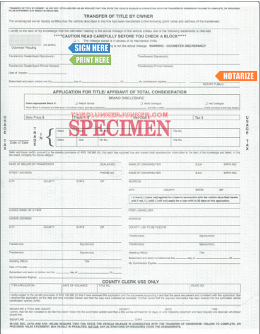 Fill out the Kentucky application for certificate of title. Bring your application to you local county clerk's office. The fee for a replacement Kentucky title is $6.00. Getting rid of an abandoned vehicle in Kentucky can be a difficult process. Unfortunately, you cannot just sell any junk car that ends up on your property if you do not own it. You'll need to follow the Kentucky abandoned vehicle removal procedures. We have given a general overview of what that entails below. Contact your local law enforcement agency to have an abandoned vehicle removed from your private property. Can you buy vehicles in Kentucky without a title? In some cases, we can! You will need to be able to prove that you are the legal owner of the vehicle by showing the buyer a valid photo identification that matches a current registration and/or insurance card. Please note your offer will generally be much less than if you did have the title, and we cannot commit to buying every vehicle in every city without title. Kentucky often changes their title documents from year to year. If you have questions about your specific title, please contact your Kentucky DDL. Unless you are transferring your registration, your plates should remain on the vehicle. They will be destroyed and disposed of by the company that purchases your vehicle. You may need to notify your county DDL that you have sold the vehicle. You can contact them with any additional questions or concerns about the transfer of your title. Once you get top dollar for junk cars in Kentucky, you’ll never need to think about what to do with your old and tired cars. Reach out to us today and we’ll get your junk car removed and your wallet fattened. After all, there’s nothing better than cruising down I-24 in a brand new vehicle while smelling the fresh Kentucky air. "The truck was bought in hopes of an off-road project. It's become an eye sore for my neighborhood, and I need it gone. The sun roof is missing, and the windows don't roll down. The truck starts and runs with a jump. The A/C blows ice cold. I tried selling it online but only get weirdos." "The vehicle is owned by my father, but I have been driving it since 2003, when I got it as a gift. He lives in in another state. He is in agreement, since he will not pay for the vehicle to be shipped to him. It's not worth that much cash. The top engine cover leaks oil, and it is overheating. " "There is only one problem. The ignition coil packs are off of the car, but we have them. It is just too hard for us to put them back in because we don't have the time to fix it." "The vehicle got into an accident a few months back. The car works beautifully, but it is not legal to drive because of a smashed left headlight, bumper, and the hood is smashed up a little as well. Everything else is in perfect condition, and it has a new hybrid battery and backup camera in the dash." "The owner of the vehicle is recently deceased. The truck has been stowed in storage for the past four to five years. The battery is probably dead. It has no power, etc. My step-mother (deceased's sister) and I are here to take care of his affairs. Currently, trying to get this vehicle back to another state is not in our best interest because of costs, either to get it running properly or haul it back. We're just looking to junk it for some cash and get it off of our hands." "I bought the vehicle as a trade. The truck drives but needs brake work. The door is bent, and it opens roughly. It has been sitting for two years. I'm looking to junk it for $800 or the best cash offer to put towards my school loans." The Clunker Junker is one of the top junk car buyers in the state of Kentucky. To date we have made instant offers on over 10 thousand vehicles across the state, totaling over $3.6 Million offered! Of those vehicles, approximately 8% were purchased without a title. We also buy cars on a wide spectrum of conditions and 61% of the vehicles we've made offers on in Kentucky do not start or drive. Many also have moderate to severe body damage. Louisville in Barbour County was our top producer, followed by Lexington.